The great thing about sewing with knit fabrics is that you can be a little loose on the specifics. Recently I made this Renfrew Top hack and ended up doing a lot of running up the sides with the serger to ‘adjust’ or, more accurately, hack away at the side seams. You have probably figured out by now that I don’t like to get too worried about the specifics with loose fitting garments. I realise this hack is probably not the most exciting piece of sewing you’ve ever seen, far from it in fact. 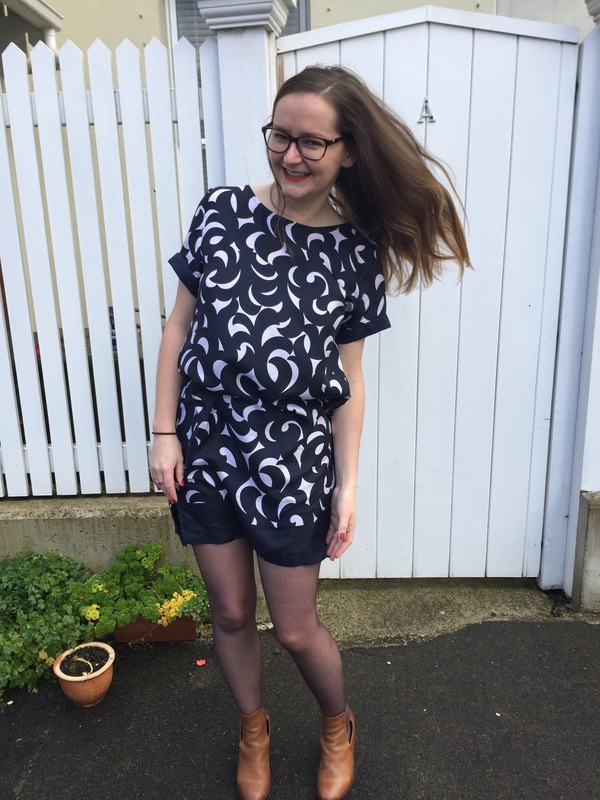 However it’s taken me an awfully long time to get back into sewing so I’m taking it easy, and taking on board your advice from this blog. I’m choosing to sew some things that come together quickly and are therefore immensely satisfying. I’ve seen many, many Renfrew hacks over the years – Amanda from Sewaholic and Jo from Make it Well have compiled extensive lists of their favourites. I was delighted to see the number of ways that the Renfrew has been interpreted, and in some cases, almost redesigned. I’ll keep this post short and sweet and I won’t bore you with my construction details – essentially all I did was lengthen the pattern from the hips, create a waist and tapper at the knees. And yes this is merino from The Fabric Store. Have you made a Renfrew hack? Link it to me in the comments! And that’s the shortest blog post I’ve ever written! One of the great things about learning to sew is that I’ve also learnt a lot about the kinds of clothes that I enjoy wearing and that suit my shape and personality. For example I feel much more comfortable wearing drapey dresses to work than skirts and tops which I feel frumpy and stout in. Today I wore my caramel Sydney with a hacked Renfrew merino cowl-neck dress (new, yet to be blogged). I know I’m banging on about the Sydney Jacket again but I adore the drama created by the shape. I feel a like million bucks whenever I wear mine. What outfit makes you feel like a million bucks? And what have you learnt about your style from sewing? One of my greatest sources of sewing inspiration is undoubtedly Instagram. The power of the hashtag to collate thousands of photos of the same pattern made up a thousand different ways is an immense resource. It’s how I often come across new patterns and bloggers. And it’s where I first came across Tessuti’s Sydney Jacket. The thing that drew me in to making this pattern was the soft drape of the design, creating a sculptural shape without being boxy or bulky. The thing that sealed the deal was the the fact it had pockets. Not sure why I look so confused in this photo! Perhaps it was the construction. I found it quite confusing. For one thing most of the seams sit on top of one another rather than face-to-face inside the garment. This was strange but things were going ok until I got to attaching the collar. I made the fatal mistake of overthinking it – the collar folds outward so the inside will become the outside so it needs to be attached backwards. Rather than following the instructions and I ended up attaching it the wrong way around. However because of the overlapping seams it didn’t really matter, it’s just not as neat as I’d like. Surely the test of a pattern is whether you want to make it again straight away? Well I did with this one. 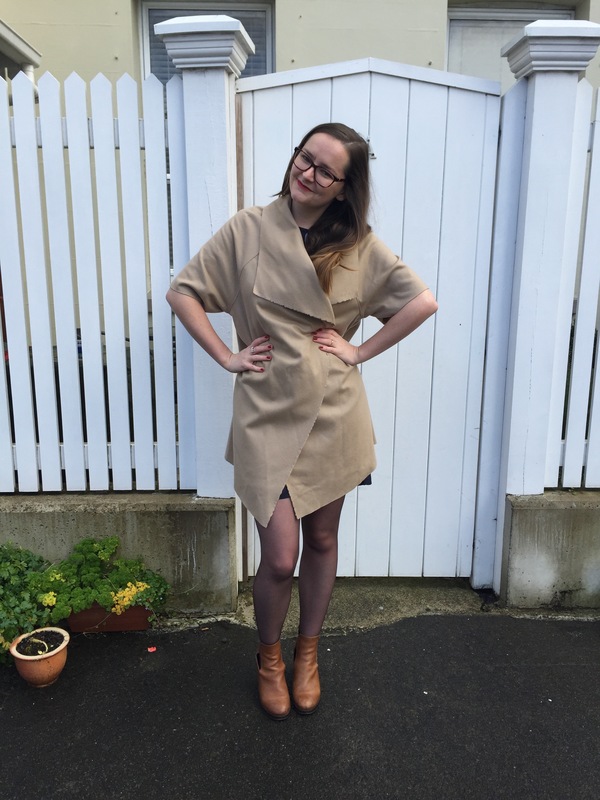 My second Sydney Jacket is made out of much nicer fabric than my first – coffee coloured cashmere – delish. Yes it is the $13/m on special from The Fabric Store, no it hasn’t pilled yet. 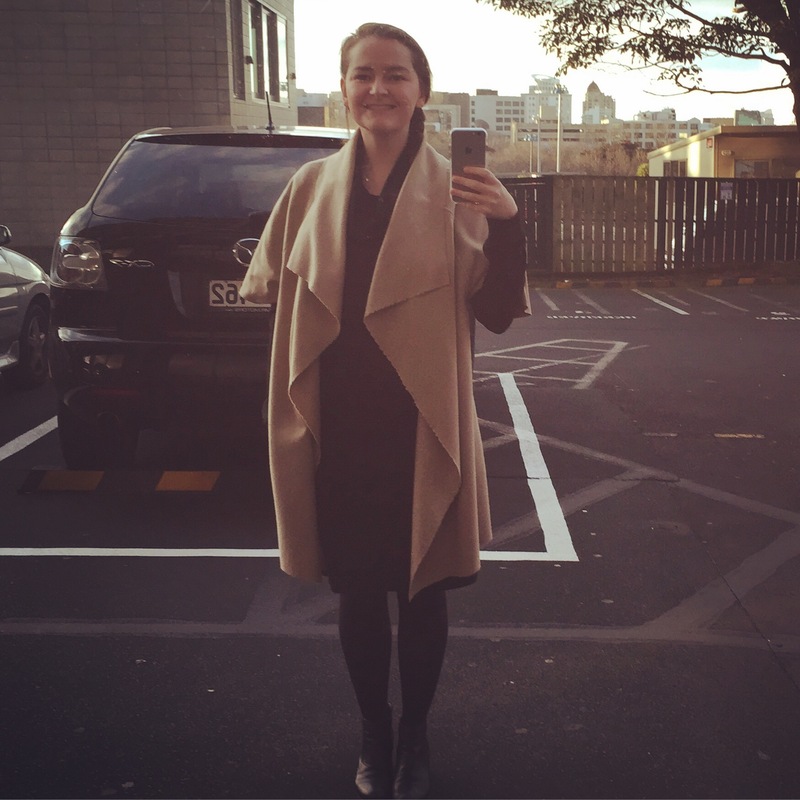 I’m pretty in love with my new Tessuti jackets, they’ve already made their debuts at #NISM2015 and my work winter ball – casual and chic FTW. Have you made this jacket? I’d love to see yours! Look! 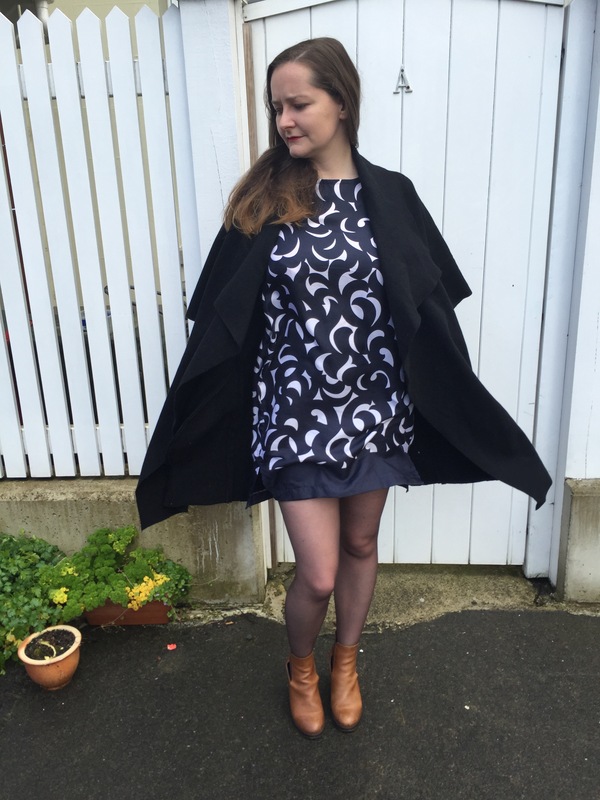 I’m finally blogging about something I’ve sewn this winter! 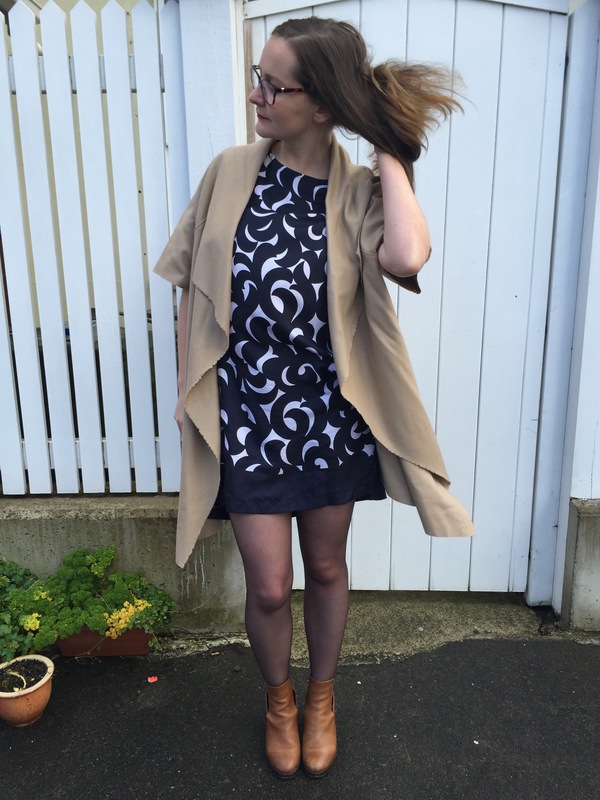 This is my Inari dress by Named Clothing. It has become such a staple that I’m bound to make another one soon. 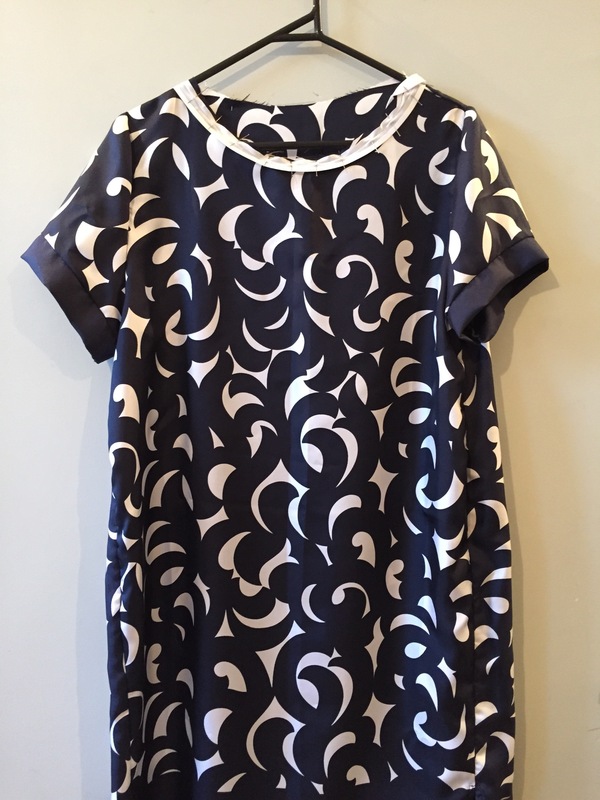 I made this dress from a lovely navy and white silk, bought from the Fabric Store (where else?) approximately a million years ago. Despite being immediately attracted to this bold print I really struggled with what pattern to match it with. The large print and twill weave made me think it would be too full-on and heavy-looking as a blouse. I was also rather precious about this fabric because it was sold in panels. And although I have no recollection of how much it cost, the fact that it was sold in panels made me think it was a little expensive. I’m not sure if this is a strange inference to make! It took me far longer than I had hoped to get this dress from the cutting board to the wardrobe. Aside from feeling oddly precious about this fabric, I’m also not terribly used to having to add seam allowances on to my patterns. Needless to say – I spent a lot of time fluffing about trying to fit my pieces on as little fabric as possible and then remembering that I still needed to add another 1cm. As you can see, I worked the navy panel edge into the dress at the hem and the sleeve cuffs – a look I think ‘finishes’ the dress nicely. As you may know, the newest season of Named Clothing designs will be available at dressesandme.com very shortly. Like their previous collections this offering is on-trend urban-chic. I’m really excited for these patterns to arrive! If you’d like to be one of the first to know you can sign up here. 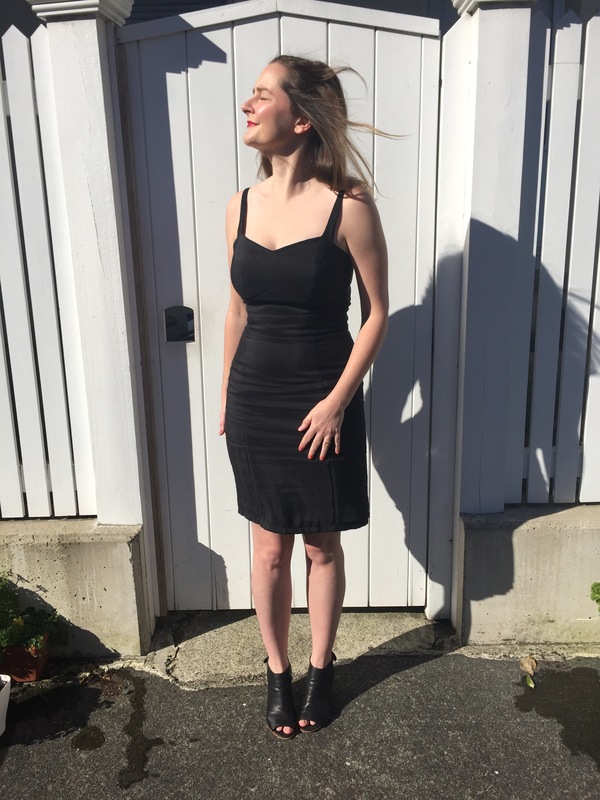 I made another Georgia dress – this time it was corporate… And by that I mean black. I made this dress on quite a whim. Because I was on a fairly tight schedule I decided to make the Georgia dress as I had made it couple of time before. I had already worked out the adjustments, it was simply a matter of sewing 20 pieces together, overlocking and throwing in a zipper. This dress is made from a black raw silk bought eons ago from Fabric Store. Because it has zero stretch and it wrinkles easily I wouldn’t recommend sewing a dress in this style. However it was still comfortable and lovely to touch. I made all the same adjustments as last time including my unofficial FBA, shortening the staps by 7cms at the back and shortening the skirt by about 15cm. I cut the long length thinking I’d like to do the mid-calf/below the knee look but it is quite a hard look to pull off when you’re only about 5 2. We had a lovely, yet corporate, night. 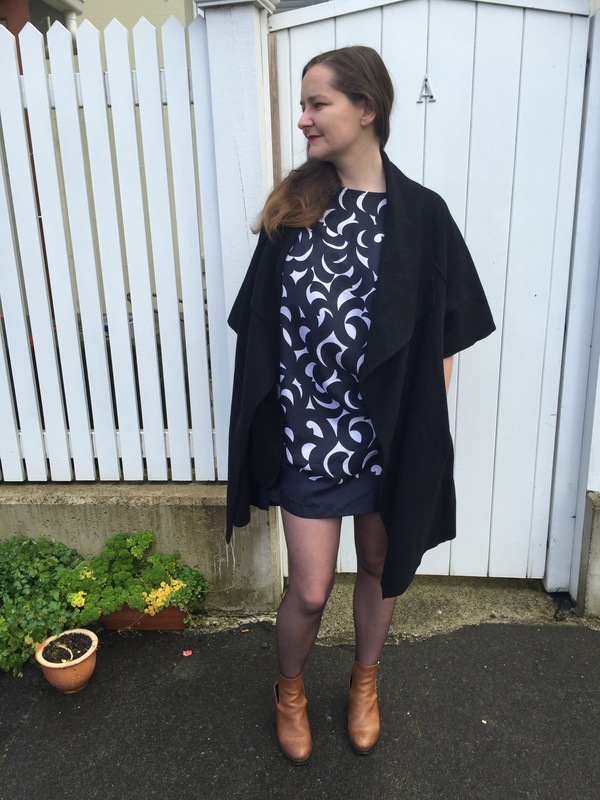 An Inari dress – just needing neck binding and hemming. This lovely fabric is from The Fabric Store (where else?!) I bought it a few years ago and it has been fermenting oh the shelf while I waited to find the perfect pattern for it. I’m not totally convinced that I did it justice with this pattern (feel the fabric might not be slinky enough for the look I was imaging) but that’s what happens when you take the plunge – some times it’s average and occasionally it is amazing. That being said, I tend to feel very ‘meh’ about almost all my sewing until I finish it. A Georgia dress, completely finished! Check out my Instagram for some more photos of it in action. This dress went from concept to completed in less than a week – quite the feat for me. This is my third Georgia so with the others behind me this one came together very quickly – all fitting requirements had been sussed in previous efforts. My first and second Georgias are here and here. I’ve nearly finished my second Davie dress (first is here). This project is taking a wee bit longer because I decided to do a black binding on the neck and sleeves instead of folding the allowance in (as suggested with the sleeves). 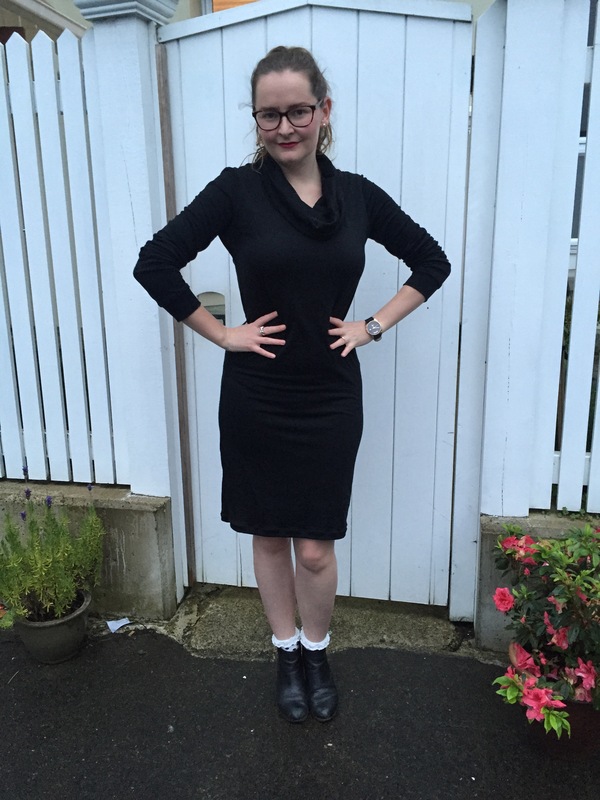 On top of all those, I also made this merino knit dress – there’s a good reason my blog is ‘Dresses & Me’, I don’t really make anything else! This is my second time using this Vogue pattern, my first is here. It was quite a gamble making this pattern with this full-on, super-intense, in-ya-face fabric. But I think it came out pretty well, the print is small enough that it blends together from a distance. So that’s just a wee sample of what I’ve been up to. 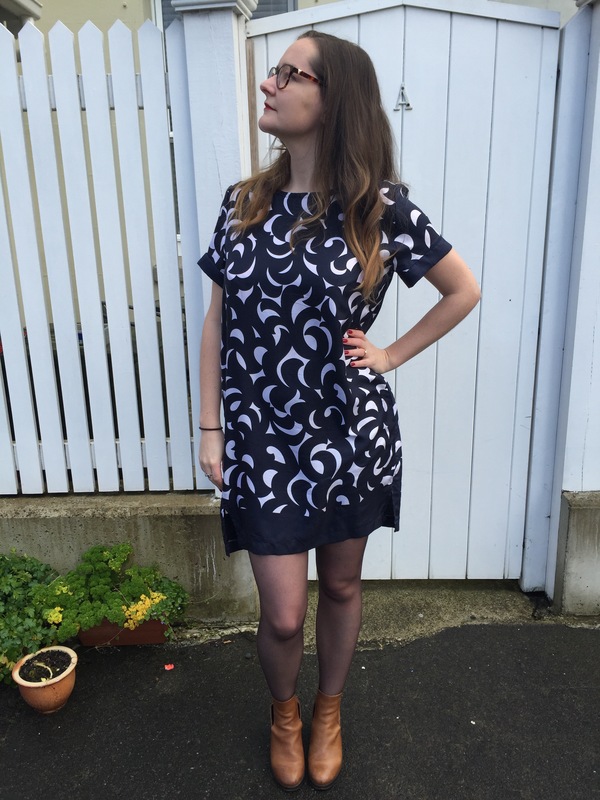 I made a Davie dress last week and I’ve already worn it three times… I think I might be in love. The dress is very easy to put together and would have been even quicker for me if I had just marked my notches. I was racing along very happily and my hems weren’t quite matching up. This isn’t too weird for me. I usually need to take a couple of centimetres off the bottom of my dresses so I can be a bit carefree when cutting the pattern pieces at the hem. So I sewed the next front and side front pieces together. Except this time they were even more off than the first side. Something was afoot. I unpicked the pieces and got my pattern out again. I had stitched my pieces in such a crazy way with my centre front backwards 😣. What a goose. I recovered quickly and raced to try it on. I liked it from the first glance… But lesson learnt. 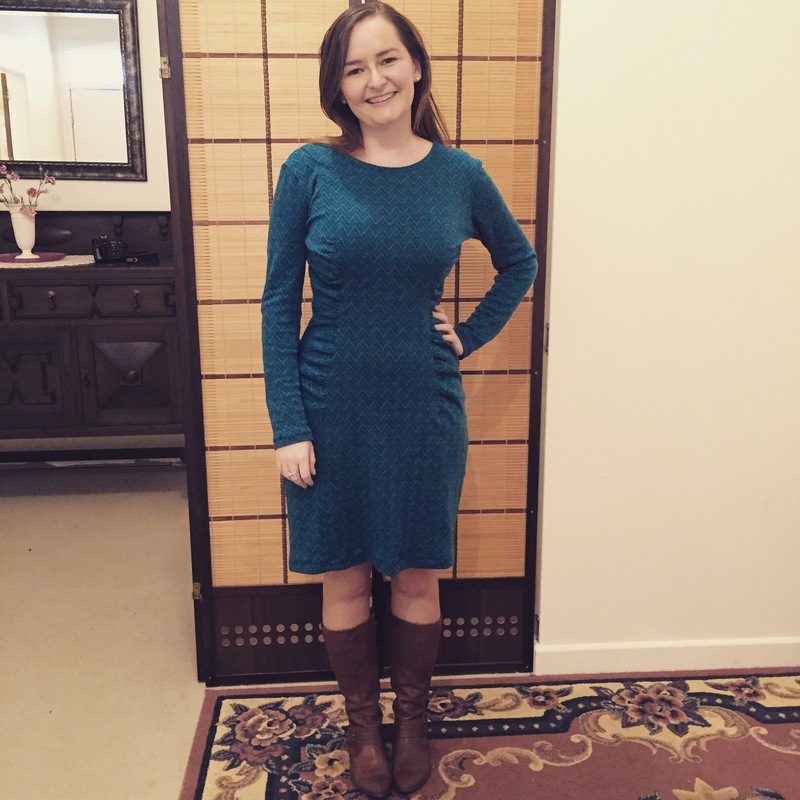 I made this dress in a pont knit from The Fabric Store. I love that indie designers are getting on board this knit fabric trend! This dress is super comfy and very easy to wear. I made the size suggested for my figures but ended up taking it in 1cm on each side. 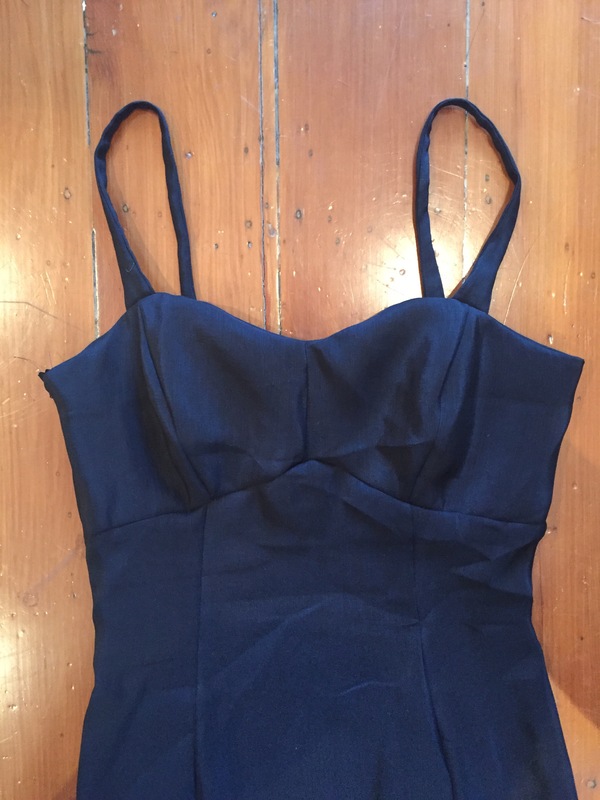 I wanted this to be a fairly fitted dress… I know this isn’t the correct way of doing things but I didn’t have the heart to undo all my careful top stitching. 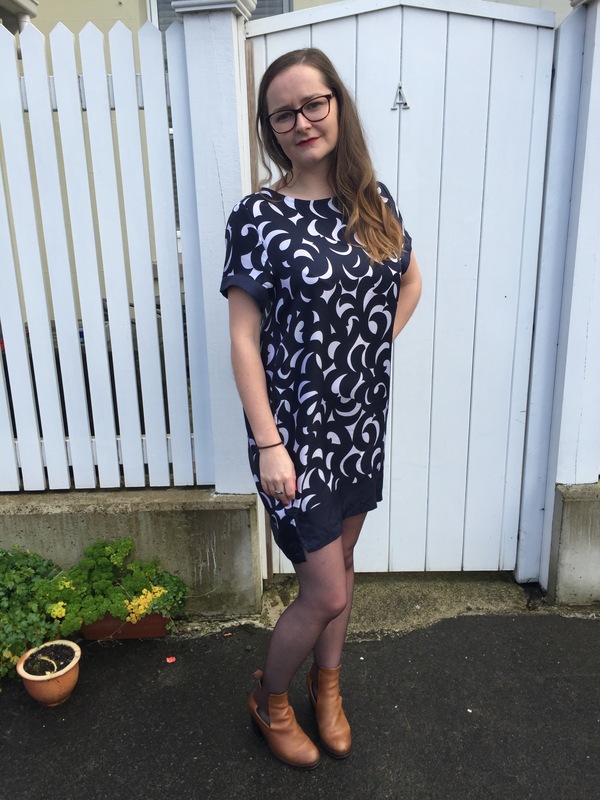 I made my Davie dress all in one size, not adjusting for pear-shaped-ness of Sewaholic patterns, despite being me more of an hourglass figure. I really like the shape of the skirt so I don’t think I’d grade it down for my next Davie.